Nearly every day, I find another little sign that spring is here. A little sign today, a little one tomorrow, and after a week or two, that all adds up to a lot of indications that the season is changing. This morning I saw a male eastern goldfinch that was about half-changed into his bright yellow and black breeding plumage. On Sunday I saw the usual group of goldfinch among the pine siskins at my feeders. Not one of those had started to molt. So, is this a "new" goldfinch? Has the molt started since then and already progressed that quickly? Did I simply miss seeing this particular goldfinch this weekend? I have no idea. I only know that Mr. Goldfinch and his lady-love appeared at the feeders this morning, and he is already starting to look rather dashing. Both this early morning and last evening I saw lots of migrating turkey vultures. The birds are flying both earlier and later in the day than is usual for them. I am blaming the weather for that. After several days of overcast and misty weather, yesterday was clear but windy, today will be sunny and less windy. Tomorrow brings the first of three days of rain. So the birds have only a limited opening for a little northward migration. Birds have a heightened sense of weather systems moving in, weather moving out and when they’d better make hay and just move. They easily sense high and low pressure systems—you would too if you could fly. But their ability to see or sense systems that aren’t here yet, is to my mind, even more impressive. That ability seems extra-fine-tuned, some mechanism that allows them to know far more than just what weather is here today and extends that to also knowing what will be tomorrow and beyond. It’s one thing for me to look at the radar and see that storm system over in Indiana, but when you see 10,000 raptors move earlier in the season than is their typical pattern ahead of a group of systems that is going to shut down migration for at least a week, you know they are seeing or sensing it, too. That’s amazing. The first boom of thunder sent the Dog, Baby Dog and assorted cats cringing and then darting for cover. They’d all forgotten, apparently, what thunderstorms are. Winter and summer are usually the times I expect extreme weather—extreme cold, heavy snow or heat and drought. However, this weekend reminded me that extremes are just as common in spring too. Thunderstorms, tornados only a few miles away, the telephone knocked out by a lightning strike. Grandmother Nature was throwing her weight around again. In the end, I was lucky, the tornados missed me and the cabin, though wreaked havoc not far to the south and destroyed mobile homes next door in Lancaster County. This morning, the sky still has an angry look to it, less angry perhaps than yesterday, but still angry enough. The freshening air brought the local vultures and Red-tailed hawks out this morning before the sun was well up. Ahead of the storms, the weather was rainy, overcast and foggy, so the raptors were taking advantage of the early morning conditions that were better for their hunting than it had been for days. I thought, perhaps, that once this storm cleared, I would start to see more of spring around the cabin. That may happen tomorrow or the next day but it hasn’t happened this morning. 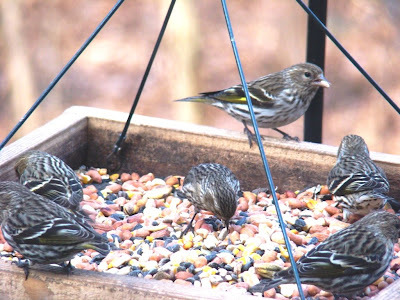 Yesterday, 15 pine siskins ate their way through my bird seed. These little finches are not inclined to move north again just yet, apparently. I am hoping, for no good reason whatsoever, that they will hang around for at least another two days so I can record them on my April bird list, which would be a first. The trees are still not showing any sign of impeding leaves, as you can tell from this morning’s photo. I do see a few fat buds here and there but even those aren’t common. Sunday, I noticed a few tiny seedlings pushing through the ground on the forest floor, but it’s still too early to call them anything but seedlings. I did see and hear the first eastern phoebe of the season this weekend. So far, I’ve only encountered a single bird and that not at the cabin, but it was on Roundtop. This is the first time I've ever seen siskins and phoebes on the same day. That's amazing enough for me, at least for this Monday morning. 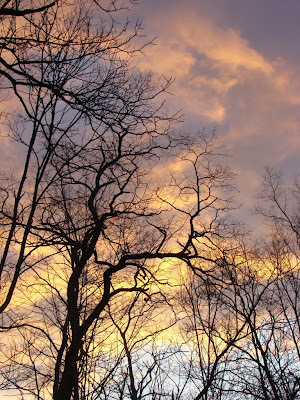 No, this photo was not taken on Roundtop—don’t I wish! 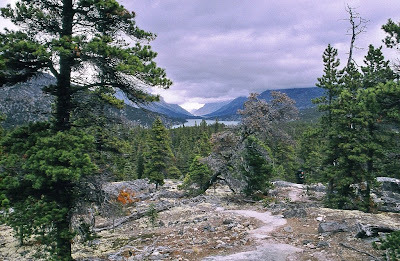 I took this photo about 10 years ago when I was backpacking the Chilkoot Trail in Alaska in late September. The view was taken on our next to last day on the trail, looking towards Lake Bennett in the distance. At this point, my hiking partner and I had the trail kicked. If you can make it up and over the Chilkoot Pass, you’ve pretty much got the trail kicked. We’d done just that the day before and were only a few miles from the night’s camp site, and we were happy campers. My plans for today’s Roundtop photo didn’t work out. Late yesterday I was driving back to the cabin. It was raining a bit and overcast. A flock of 20+ wild turkeys ambled across the road, ruffling their feathers, the males displaying their tails and all of them generally just doing what turkeys do. I took a couple of photos. Unfortunately, none of them are clear, even though they looked fine in the little 2 inch camera view . It was too dark. Well, that’s what happens sometimes. So I ended up photo-less for the day, with my only options to not post today, or not run a photo today or to use an old photo. I’ve been organizing some of my Alaska photos recently, so I thought, why not? Anyway, back to reality and Roundtop: I’ve still not heard the first eastern phoebe of the season, so the species is now officially late by my records. An average arrival date for the birds would have been two weeks ago. This isn’t a surprise. Phoebes aren’t like swallows returning to Capistrano on the same day every year. Phoebes show up when conditions are right for them and not before. The weather is getting close, I think, to what they consider "right." Bird migration seems to be running a bit late this year, judging by the pace of reports from the spring hawkwatches. Vultures are moving in good numbers, and Red-tailed hawks are moving decently. Eagles of both species are moving north (but those birds are strong enough to fly in almost any weather). The rest of the crowd—falcons, accipiters and smaller buteos—not so much yet. Roundtop got about .25 inch of a nice gentle rain, not nearly enough to impact the 5 inch deficit, but it was a start. Once this rain clears the region, I think spring and bird migration will take a big step forward. All at once. Stay tuned. A little rain is falling on the mountain this morning. Very little, actually, and not nearly enough to impact the nearly 5 inch rainfall deficit. Still, it’s enough to likely end the red flag fire warning that the area is under currently. At least I hope so. This is certainly the first time I’ve seen one of those in March. In any event, the overcast skies made it too dark to take a photo this morning, so I am posting one I took on Monday evening. Today’s photos is a lichen. Pennsylvania has over 400 species of lichens, I’ve read, but I’m not really able to identify many of them. Sometimes I think I can identify the family, but further investigation often makes me doubt even that much. What I can tell you is that a group of small trees in this one spot are pretty much covered with this particular lichen. I am thinking this is one of the so-called green shield lichens, which are both common in my area and commonly grow on tree bark. If so, then this is not a plant. Green shield lichens are a combination of a fungus and either an algae or a photosynthetic bacteria. 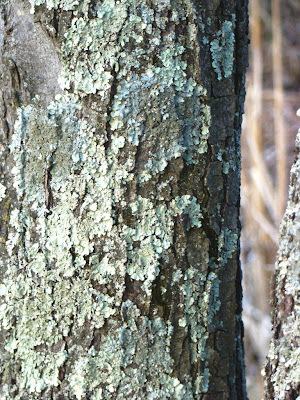 Like all lichens, they tend to be sensitive to pollution, which is why they are not commonly seen in urban areas. However, that said, this particular lichen family is apparently at least somewhat less sensitive than most. They are said not to harm the trees on which they grow. I suspect this is flavoparmelia caperata, the common green shield lichen. This variety likes clinging to tree bark, but will also grow on rocks, and the round or oval rosettes are typical. The surface of the lichens gets greener when wet—that’s the algae part migrating to the surface. Maybe it will be greener tomorrow. I'll have to check. 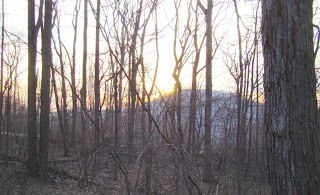 Living in the forest in late March and early April is a quiet time and one that I enjoy and look forward to every year. For a few weeks, if I am lucky, there is this lull that seems to take hold, if only briefly. Winter is over, the big parka put away for another year. Being outside is easier again. The snow cover is gone, and even though I only had a few inches of it this year, a few inches is all that’s needed to make foot travel a bit complicated. Spring is not yet here. At least, the full blown part of spring isn’t here yet. The majority of the migrating birds have not yet arrived. New growth hasn’t started yet. In fact, the nights are still fairly deep into the 20’s, though the days tend more and more towards 50F. In the mornings, I hear a few robins sing, but the loud dawn "Hallelujah" chorus with many species is still weeks away. In this particular spring, rain hasn’t yet added its notes to the quiet around me. The winds of winter that made even a normal winter temperature feel frigid have calmed. This morning the forest is still, the birds quiet. It’s like the forest is at that point between the inhale and the exhale of breath. 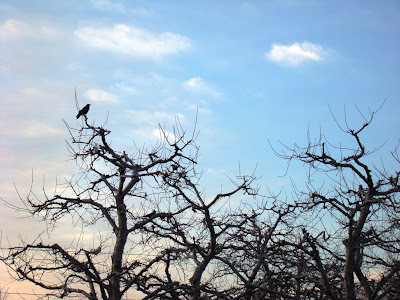 Even the crows are quiet. They are not still, and move from perch to ground and back again. Watchful and alert but waiting, perhaps, for something else to make the first sound. 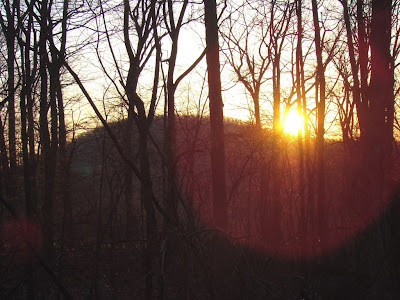 Where I live, the largest habitat around me is the forest that covers the mountain. It’s not the only one, though. Roundtop has many ponds of varying sizes, most created over the years as areas to hold water for winter’s snow-making. But a manmade pond is still a pond, and I doubt the flora and fauna that benefit and live around them know the difference. 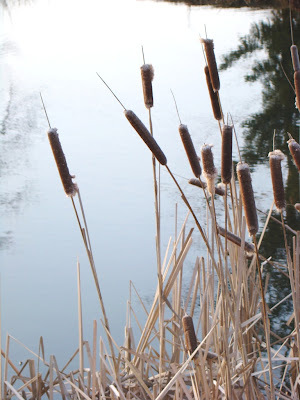 Plants, like these cattails, thrive around the edges of the ponds. In turn, the plants create homes for frogs and nest sites for red-winged blackbirds, among others. Dragonflies are common in summer. Virtually every day I see the deer or foxes either going to or coming from the ponds, which is where they find water. All in all, these manmade ponds are now thoroughly colonized by the same citizens as natural ponds, and everyone seems happy. I have often wondered where the deer and foxes would go for water, if the ponds were not here. 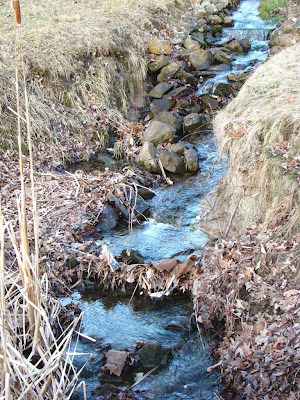 A few seasonal streams rush down the mountain in springtime, but the only true source of open, natural water is at the bottom of the mountain, and in dry years, there is precious little of that. Overall, the manmade ponds, I believe, have contributed both to the diversity of species I now find on the mountain and to the health of the ones that would have been here anyway, though likely would be found in fewer numbers. If it’s one thing I’ve discovered about natural species, it’s that any of them that can take advantage of a human-altered landscape will. Somehow, the tiny cattail seeds found these ponds, carried on the wind, no doubt. Those seeds were the lucky ones, as who knows how many more fell on the miles of forest floor that surrounds this little pond. Those will never grow, as these have. Nature finds a way, eventually, to succeed against overwhelming odds. 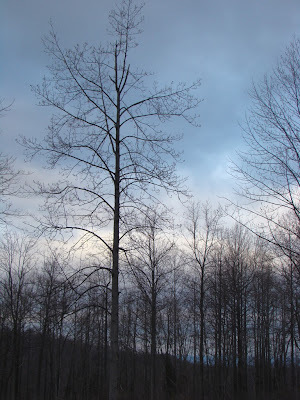 Today’s photo was taken at spring equinox (March 20). This photo was taken 23 days after my second photo for Experiment #2 (see below). 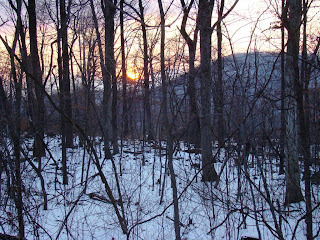 The sun is now setting quite a bit further north than it was back in early February, when I took the first photo. No wonder the days are now warmer. Equinox is a time of balance between the hours of daylight and the night. It marks the time when winter is over and spring begins to take hold. And yet, both winter and spring are still in evidence here on the mountain. I still have pine siskins at my feeders, but the robins are here too. I have a fantasy that I will somehow get a photograph showing both the siskins and the robins in the same frame, but I am already realizing this is something of a fantasy. So far, I haven’t seen the two species within 50 yards of each other, let along close enough to get them both in the same photo, though the idea that this year such a photo is at least a possibility keeps me on the lookout. Over the weekend, I saw my first Mourning Cloak butterfly stream past as I enjoyed a few moments of sunlight out on the back deck this weekend. They are always the first butterfly of the spring season, but I seem to always be surprised when I see them. Perhaps it’s simply that after the butterfly-less winter, the sight of the first one is a happy sign that spring is truly here. This weekend, Turkey Vultures were migrating north in good numbers. I saw many kettles, or flocks, of them, each with perhaps 10-15 birds. I saw a few hawks, too, mostly Red-tailed Hawks, circling and heading north. At least a few of those must have been migrants, though on warm days like this one was, the local birds could be out enjoying the air, too. The days are warm, flirting with 50F though not always successful at reaching that temperature. The nights are often still down in the 20’s, sometimes the lower 20’s. 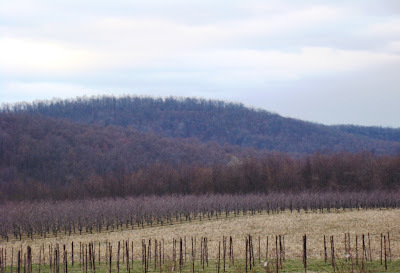 The old and new seasons are side by side here on Roundtop right now--winter with spring, old with new, siskins with robins. Like the equinox itself, this balance will be held but briefly and then the year will turn a bit more and winter will be gone. Open water. Spring. The two go together. Waterfowl won’t move north until the lakes and rivers are open enough to welcome them. Frogs and spring peepers need open water, too. Spring is not just a time of new beginnings. It can also mark an opening, or a re-opening, after the hibernations of winter. In winter, it feels natural to huddle around the warmth of a fire while snow rages and temperatures plummet outside. Winter can be a time of learning and of study. But after a while, after a few months, we grow restless. What is at first enjoyable begins to feel a bit claustrophobic. When spring arrives, the change in temperature and weather encourages greater activity and exploration on our part again. No longer the early hours of darkness. No longer 10 minutes needed to get dressed for the outdoors. Spring is when we first put our winter studies into practice, to see how winter's retrenchment and reflection has taken hold in our souls. Spring is the time of awareness and growth, the time when we see how the winter has changed us. We should be open again, too, just like the rivers and streams. Isn’t that a cute little deer? This is one of the two cute little deer that have survived the winter using my two juniper bushes for browse. 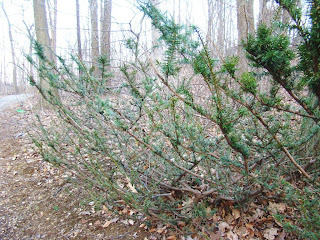 The second photo is one of the juniper bushes, which is pretty well eaten down to the bare branch. The top of the bush is where the deer can’t reach. That’s why it looks so much better. I’m not worried about the juniper bushes. Every few years or so a winter is harsh enough that deer eat them like this. In a few months it will be as good as new. But I do think the before and after photos on the same bush are interesting. I also find it interesting that this winter has been so hard on the deer that they were forced into my driveway to eat the junipers. In many ways, the winter should not have been difficult. The temperature was roughly average, perhaps even a hair above average. 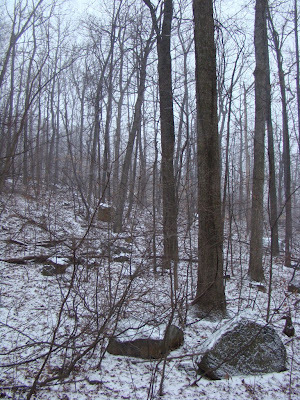 Snowfall was virtually non-existent, so the forest floor was open for browsing nearly all the time. Deer, however, eat a lot of acorns and they were in very short supply last year. 2007 produced a bumper crop of them but 2008 was a dud for acorns. Lots of folks have posited reasons for the lack. At this point, I think the trees were just resting a bit after 2007. In any event few acorns directly translated into a tough winter for deer, even though the forest floor was bare and they would have had no trouble finding anything that lay on the ground. Since they were still left with nothing to eat but my juniper bushes, I can only emphasize how important acorns are to deer in winter. I can also say that anything else that remains on the forest floor during winter apparently is so limited that deer can’t get a decent meal from it even when that forest floor isn’t covered by snow. I can’t imagine that there isn’t something down there for a grazer to eat, but whatever it is, apparently there isn’t much of it. And one final thought: imagine how difficult this winter would have been for the deer if snow cover had blanketed the forest floor during it. With few acorns, lots of snow cover and essentially little or nothing else around to provide a good meal, I suspect that many of last year’s fawns, like this little guy, simply wouldn’t have made it through a winter like that at all. Robins are arriving in good numbers here on Roundtop. The worms are up, so the robins are here. I have noticed that none of the robin yet have the white spots on the outer tail feathers that marks their breeding plumage. At this point, when I see robins, I see them in flocks. They don’t appear to be settling in or defending territories yet. No hint of greenery is peeking through the brown of last year’s grasses, but waterfowl are moving north, robins are here, and the nights are no longer always below freezing. The days have been gloomy and gray, though don’t bring much-needed rain. Primarily because snowfall was non-existent here this past winter, the area is now 4 inches behind in precipitation, an amount that can not easily or quickly be made up. My seedlings are now sun-starved and grow long and stringy from the lack. The spring hawkwatchers are starting their watches, though the numbers of birds spotted are still low, and many report more sightings of geese or siskins than of raptors. I have not yet heard spring peepers, but I have glimpsed a frog on one of my dog walks. As it was more of a splash than a frog, I can’t tell you what kind it was. Spring is here in many ways, though the woods don’t yet look much like spring. The forest still looks like November, though without the ice. The evenings are warmer, and smell of good earth. The birds know it is time to move north; more arrive or move through each day. Soon the first shoots will push through the softening ground and the woods will turn green again. More siskins than ever before! Sometimes I’m surprised when I am looking for information about a species and find that the information apparently doesn’t exist. Such is the case with today’s pine siskins. All winter long I’ve had 3 or 4, and perhaps as many as 5 pine siskins at my feeders. After a late arrival compared with other local feeders, the birds have appeared daily and often multiple times each day at my feeders. This weekend, I suddenly have 10 pine siskins. The siskins visit at least three times a day and likely more as even I don’t spend every waking moment in front of the feeders to keep track of them. So, my question was simply, are these likely to be 10 new siskins or my regular 5 siskins plus 5 new arrivals? And what I’ve discovered is that the spring movements of these birds are apparently not well studied enough to even provide a reasonable guess to that question. Because these birds are irruptive and only head south when food supplies in the north are lacking, studying spring movements of siskins here in the south is inherently problematic. I found no studies about when the birds are likely to head north again. The only answers I can find are anecdotal. Spring movements back to the north are called "protracted," based on when they return to their breeding grounds, with no actual peak to their movements. In my area, anecdotal evidence suggests the birds could continue to eat pounds of seed here in Pennsylvania well into April. So I don’t know how long these little beauties will continue to grace my feeders or for how much longer they will continue to eat a hole in my birdseed budget. The only thing I am really sure of is that whenever they do head north again, they will be as fat and happy as my seed can make them. You might not hear from me for a few days. I’ll be away from high-speed internet for a bit, which makes uploading photos problematic. I expect to return on Monday, if I don’t have connection success before that. With a little luck, I will be on before then, but I’m not going to count on it so I’m giving everyone fair warning. I'm not going far but I am hoping for a few new photos and stories to report whenever I do make it back online. 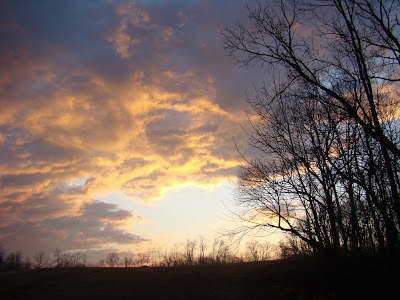 The sunrises over Roundtop have been particularly lovely this week. It’s the clouds, of course. Good sunrises and good sunsets need clouds to enhance them. When skies are perfectly clear, the sun simply clears the horizon and the day begins with no particular drama to announce it. The clouds add color to the sky and alter the lighting that falls here on the mountain. When I can catch the reflection of good sunrise in a pond, that doubles the effect and make it even better. Usually I like sunrises better than sunsets. 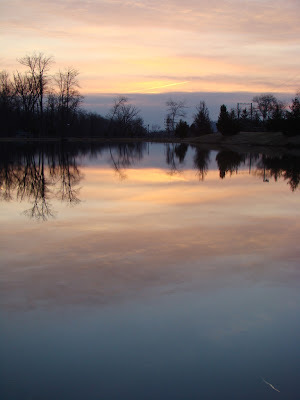 For one thing, I can’t usually catch a reflection in a lake or pond during sunset but mostly, I just think sunrises are prettier, even though sunsets seem to get most of the good press. That whole riding off into the sunset thing has been way overdone, in my book. I think riding off into the sunrise sounds a lot more interesting, as though the story is just beginning instead of ending. Sunrises signify that I’ve made it to see another day and have a whole new day in front of me. Both of those things are good things. When the sun is setting, the day is over and who knows what the night might bring? Better to have a sunrise in front of me, I say. I prefer possibilities to endings. Spring is sneaking up on me, one tiny step at a time. 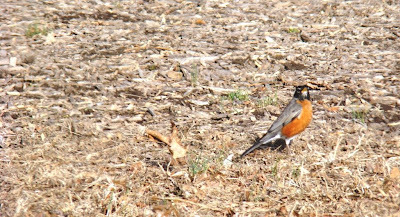 Yesterday, I heard the first killdeer and the first robins. Late in the afternoon I saw a flock of Canada geese, v’ed high over the cabin and heading north. 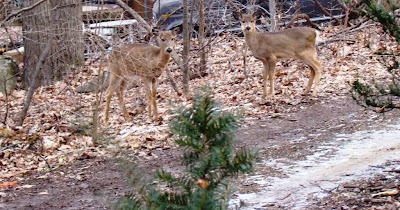 And yet, the pine siskins are still daily visitors to my feeders, and the two lost little deer are eating my juniper bushes because it’s the only food they can find. The grass is still dead and brown with little sign that it will turn green soon. The deer are tamer by the day, almost by the hour. On Saturday I drove into the cabin and past the deer, who didn’t move and barely looked up from eating the juniper. I got out of the car, took the groceries from the back, made two trips in and out of the cabin, and still they stood there and ate, not 15 feet away. Sunday afternoon I went outside for a walk and when I opened the front door, one of them stood at the bottom of the steps, two front feet on the lowest step so it could reach higher on that juniper bush. It did move when I stepped outside but it was in no hurry. I am poised between winter and spring, neither wholly in one season or the other. Pieces of both seasons surround me in almost equal parts, balanced precariously. Soon the balance will tip and give way to spring. I can’t even imagine how many times this has happened in our earth’s life. The seasons are turning again today, an old tale in a new year. Surprise, surprise. The little deer I’ve been seeing at the cabin is not one deer but two. This morning I saw the two of them together for the first time. The little deer on the right is the one I’ve seen (and nearly hit twice now) most often. When I look at the faces of these deer, I see quite a difference between them. That little guy on the right has more of a "cute" and fuzzy look than the one on the left, which has a rather graceful face. Both the little deer appear to be orphaned, and I’m guessing that mom wasn’t around long enough to teach them any wariness. They have discovered my juniper bushes now and have been happily foraging on them for at least the past few days. Every day they grow more bold and less likely to run when I go outside. Yesterday, I even suspected that the deer was (well, "were" now since there are two) sleeping under the cabin. The land was never leveled when the cabin was built. Instead, one side of the cabin is raised 3-4 above the ground. 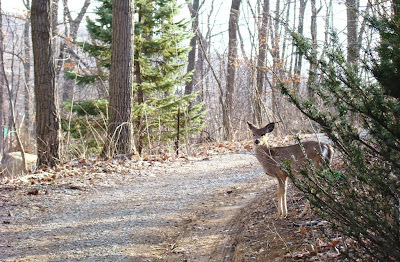 Anyway, yesterday morning when I opened the back door to fill the bird feeders, little-deer-on-the-right suddenly appeared right next to the cabin, sort of shook himself and wandered slowly down into the woods. 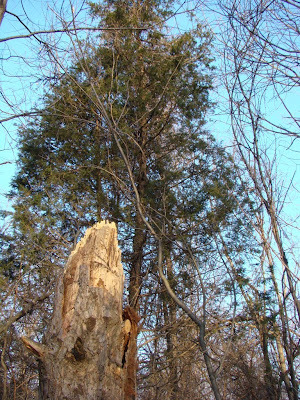 The night before, I heard a large "bump" coming from the juniper bush beside the cabin and just off the front deck when I stepped outside one last time before bed. For at least the past week, not a day goes by that I don’t see one. Sometimes it’s just a fleeting look. Sometimes the little fuzzy one will simply stand and stare at me. I see them out behind the cabin, in front of the cabin and regularly in the driveway. They are chomping the juniper bushes because there’s little natural forage right now. Although the snow cover melted yesterday—a few patches are left—it’s still too early for new growth, even new grass growth, which will spring up with the first rain. Last year’s acorn crop was essentially non-existent. So the deer are hungry and taking advantage of what little they can find—in this case my two juniper bushes. I’m not worried about the juniper bushes. They will recover in a few months time. I am sort of hoping the deer will move off as soon as the grass is green again. I don’t want to hit one, and they shouldn’t be as tame as they are, though I know I won’t have the heart to chase them off. In March, even the cold weather here feels warm. I find myself running outside for one thing or another with a cap and gloves as my only outer clothes. Then I look at the thermometer and it reads 12 degrees. Of course, I’m not standing still outside and I’m not spending hours outside dressed like that. But now that the wind is calm and the sky is sunny, the temperature feels perfectly fine. Comfort is a relative thing, I guess. In October, say, after the warmth of summer, 12 degrees would feel criminal. And even today, with a little wind or clouds to hide the sun, 12 degrees wouldn’t feel very comfortable. And it certainly wouldn’t feel comfortable enough run outside without a coat. And in the weak sun of January, I’m not sure even calm winds and a sunny sky would make it feel very warm. But for today 12 degrees is a fine temperature, and I even have the possibility of the afternoon breaking the freezing mark. This morning the male northern cardinal has upped his game, going from singing to his lady love to chasing her. She is not foolish enough, just yet, to fall for his pursuit—not this week anyway. But still, spring is no longer far away. Indeed it is just a short ways down the trail and around the first bend. Storms are funny things. Sometimes you get them, sometimes you don’t. I’m not surprised when a storm that is several states away doesn’t reach me or even one that is counties away. But when just a few miles makes a big difference, the difference simply feels odd. I noticed that (again!) earlier this winter during two of the ice storms. I felt as though I was living in the middle of Dr. Zhivago, but when I drove down off the mountain, suddenly I was somewhere else. This latest nor’easter was like that, though this time the folks who live 7 miles south of me were in Dr. Zhivago, not me. Roundtop ended up with perhaps 2-3 inches of snow. It’s hard to measure because it blew all over the place—still is. I took this photo early on in the snow, when I still had little more than a dusting. But just to the south of me, in York, they had 10 inches of snow. Schools were closed, people didn’t make it to work because the highway was a whiteout and then drifted shut again before the plows were a mile up the road. Once again I have a pretty little snow—at least that’s how it looks from inside the cabin. The siskins are chasing the titmice away from the feeder. The squirrels are chasing the siskins away. The little deer is munching on the juniper bush at the foot of the steps. Outside it’s 4 degrees with 15-20 mph winds gusting to 30 mph, so that’s not too pretty. But it’s not Dr. Zhivago. The big coastal nor’easter did not produce the major snowfall here that was forecast. I did get several inches of snow from it, but the big snow that I was hoping for didn’t materialize. Since it is now March, I may well not have the opportunity to use my cross-country skis or snowshoes at all this year, which would be a first. 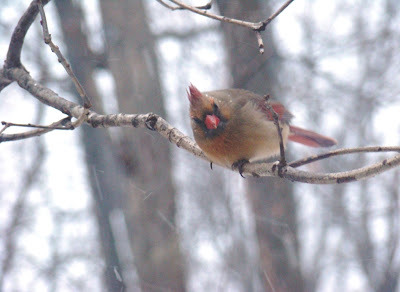 I doubt the local birds and animals will mind much if the winter passes without a major or even a semi-major snowfall. The little deer that I saw last week is trying to make itself a nuisance. I almost hit it in my driveway on Saturday. My driveway is L-shaped, and I can’t see the bottom of the L until I make the turn. The little deer was standing right there when I did. It’s a good thing I wasn’t going too fast. Then yesterday it actually peered at me in the cabin. Baby Dog was yipping, so I went to the door to look out and see what it was, figuring that one of the local raccoons must be on the front deck again. It wasn’t a raccoon. It was the little deer, peering around the edge of the cabin, eyes wide, more curious than afraid. Even then it didn’t run off. It just switched its tail a time or two and casually moseyed off into the forest. It must be that its mother is dead and so not around to tell it what it should and shouldn’t be doing. It looks healthy enough, and if it can make it through the next two days of bitter cold, it may well survive the winter. Hopefully, at some point it will wander far enough to hook up with some of the other deer on the mountain, and perhaps them it will learn more wariness.